Hyderabad: Accusing the Congress party of meting out injustice to minority communities in allotment of seats, the party’s senior leader and former Minorities Commission Chairman Abid Rasool Khan submitted his resignation to Congress President Rahul Gandhi on Thursday evening. 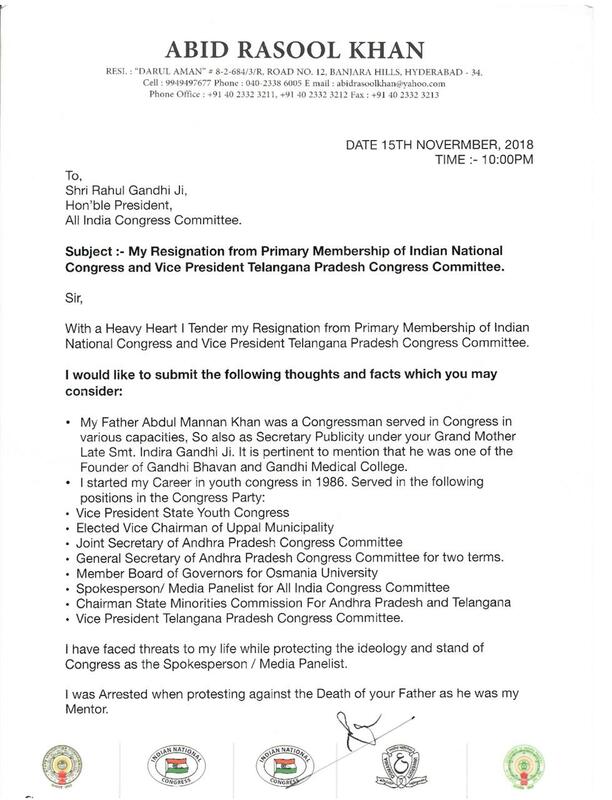 Khan, who was serving as vice-president of Telangana Pradesh Congress Committee was joined by Mohammed Khaleequr Rahman, serving as national coordinator in the AICC minority department, and three other district-level leaders, who sent their resignation letters to Rahul Gandhi. 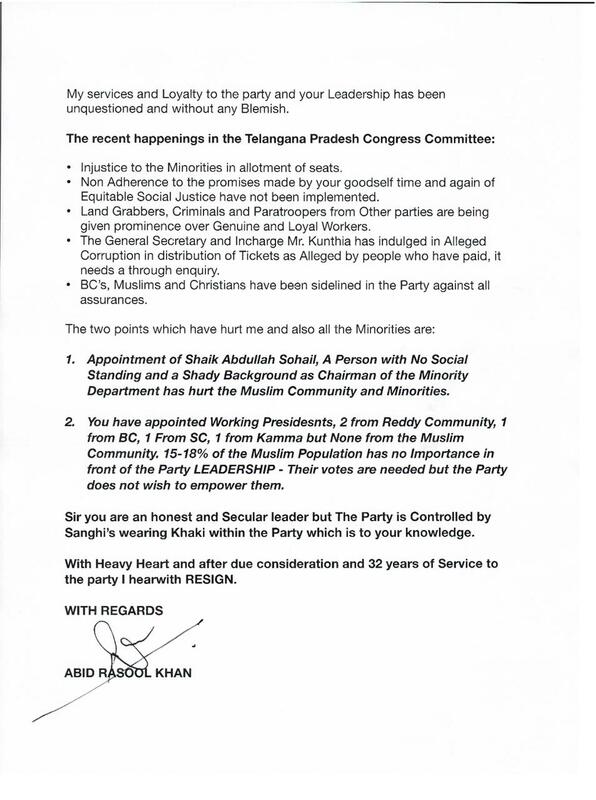 In his resignation letter, Khan said that he was hurt and was resigning based on two reasons – the appointment of Shaik Abdullah Sohail as the Chairman of the Minorities Commission, who he called “a person with no social standing and a shady background”; and second the fact that Congress appointed working presidents from the Reddy, SC, Kamma, and BC communities, but none from the Muslim community. “15-18% of the Muslim Population has no Importance in front of the Party LEADERSHIP. Their votes are needed by the party does not wish to empower them (sic),” he wrote in his resignation letter. Abid Rasool is a second generation leader in the Congress Party. His father Abdul Mannan Khan was a well-known leader, who served as Secretary Publicity under the late Prime Minister Indira Gandhi. He would be joining the Telangana Rashtra Samiti (TRS) at Telangana Bhavan today. In his letter, he alleged that landgrabbers, criminals and paratroopers from other parties are being given prominence over genuine and loyal workers. “BC’s, Muslims and Christians have been sidelined in the party”. The Congress is part of the Mahakutami – an alliance with the Telugu Desam Party (TDP), Telangana Jana Samiti (TJS) and the Communist Party of India (CPI) to take on the ruling Telangana Rashtra Samithi (TRS). Congress, which is heading the alliance would field nominees in 94 seats, while the TDP would contest in 14 constituencies, TJS in 8 and the CPI in 3. Telangana goes to the polls on December 7 and results will be declared on December 11.